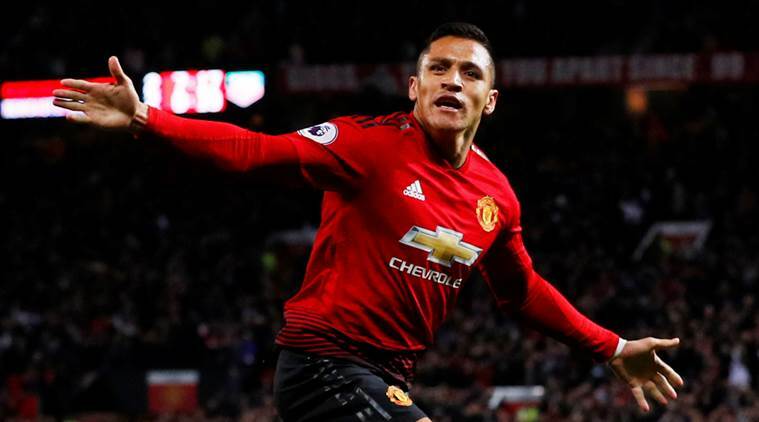 Booed throughout his return to Arsenal, Alexis Sanchez responded to the rancor with a rare goal for Manchester United and reveled in the celebrations. The forward's fifth goal in 33 appearances since leaving Arsenal a year ago set United on its way to a 3-1 victory on Friday that booked a place in the fifth round of the FA Cup. There was a fiery conclusion when Arsenal defender Sead Kolasinac squared up to United forward Marcus Rashford, setting off a melee that Jesse Lingard and Arsenal midfielder Matteo Guendouzi became embroiled in which spilled off the pitch. United captain Ashley Young also picked up a coin that appeared to have been thrown from the crowd. With Lingard and Anthony Martial also scoring, Ole Gunnar Solskjaer reeled off a club-record extending eighth successive victory in all competitions at the start of his United reign since replacing the fired Jose Mourinho in December. With only a short-term contract on loan from Norwegian club Molde until the end of the season, Solskjaer is making it increasingly hard for United to consider any other option for its fourth permanent appointment since Alex Ferguson's retirement in 2013. "I'm not here to get excited, I'm here to keep on improving the team, improving the players," Solskjaer said. "Our structure was miles, miles better. We have been working on that because we need to dig in and defend properly against good teams." Solskjaer's priority is lifting United up the Premier League where it is currently sixth behind Arsenal. Revitalized United was rarely troubled by an Arsenal side that beat Chelsea in the league last weekend. Electric on the break, the visitors couldn't be contained at times by the hosts. When Romelu Lukaku slipped the ball through to Sanchez in the 31st minute, the Chile forward took the ball around goalkeeper Petr Cech before placing it in the net. Sanchez raised his arms aloft to the Arsenal fans who had targeted him with jeers. They had little to cheer. Not after Arsenal fell further behind inside two minutes after timidly giving United too much space. Luke Shaw worked the ball out from defense before releasing Lukaku on a run down the left flank. The forward completed the counterattack by squaring for the unmarked Lingard to sidefoot into the net and then celebrate with a Michael Jackson-style Moonwalk dance. "The way they celebrate shows they are happy," Solskjaer said. Arsenal had a glimmer of hope in the 43rd when Aaron Ramsey weaved in from the left and put the ball through Eric Bailly's legs across to Pierre-Emerick Aubameyang for a tap-in. Having already lost Sokratis with an ankle problem in the first half, which coach Unai Emery later said was not serious, Arsenal's defensive injury problems deepened after the break when Laurent Koscielny was forced off with a suspected broken jaw after being caught by Lukaku. The French defender was hospitalized. "In this moment we had the possibility to grow and to win," Emery said. "But these injuries — especially the one to Koscielny — didn't help us because our rhythm went down." Any hopes of forcing a replay ended when Martial netted in the 82nd after Paul Pogba's attempt was parried. It leaves Emery's only route to silverware in his first season since succeeding Arsene Wenger lying in the Europa League which he won three times with Sevilla. "I'm happy because I think our work is good, but the result is bad," Emery said.